Derek Anastasia will be among those with some interesting stories to tell at a Champaign Central High School 20th-year reunion next week. Anastasia has traveled all over the world, worked on Wall Street and Madison Avenue, and pursued sports ranging from marathon running to scuba diving since he lived in Champaign 20 years ago. Along the way he has become a world-class collector of antique enameled cuff links. Don't get him started on the details unless you have hours to spare. Anastasia currently has 1,638 pairs of cuff links  enough so that he could wear a different pair every day for 41/2 years. He also has more than 700 singles he is trying to match. If you like statistics, he has been able to match 18 of the singles in 15 years. "When I told the president of our society that, his reaction was 'Get a life,'" Anastasia noted. The National Cuff Link Society currently has about 8,000 members. In last December's issue of "Glass on Metal, The Enamelist's Magazine," Eugene Klompus, the head of the society, said of Anastasia, "Because of his unique and specialized knowledge, he has clearly moved on, surpassing the veteran collector stage and become what can be considered a 'living memory' in his field." Anastasia was a guest last month on the PAX television show "Treasures in Your Home: The World of Collecting." Promotional material for that touted his collection as "the largest and most pristine, vintage and antique enamel cuff link collection in the world encompassing all the major art styles." Anastasia grew up in Champaign, where he attended Bottenfield Elementary, Edison Middle and Central High schools. His father is Fran Anastasia, an agent with Coldwell Banker Devonshire Realty, and his mother is Tad Anastasia, a pharmacist with Carle Rx Express. Anastasia has 1,288 pairs of cuff links, worth well over a half-milliion dollars. Derek Anastasia's life with cuff links started in 1984  the year he got his business degree from Indiana University. As a graduation gift, his grandfather gave him a pair of antique gold cuff links. "I was a kid who didn't even know what a French-cuff shirt was," Anastasia said. "But I got one and wore it to job interviews. One interviewer told me it was 'a bit much.'" But the shirt and cuff links fit right in when he went to New York City in 1985 to work on Wall Street with attorneys and bankers. After eight years in investment banking and advertising, Anastasia started his own business as a consultant in Competitive Financial Intelligence, which he describes as "hard to find or to disparate pieces of data." 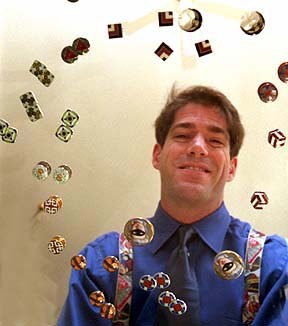 Derek Anastasia and some of his cufflink collection. He maintains homes in New York City and Fort Lauderdale and travels constantly. Traveling and collecting cuff links go well together. "I am kind of paid to do this travel, and I can find a link and put it on my sleeve and go," Anastasia said. "My work takes me all over the world, and I spend my down time looking for cuff links," he said. "They are my all-consuming passion. I remember shopping the Grand Bazaar in Istanbul, Turkey, and finding two pairs at great prices in a tent with camels moving around." Anastasia recounted the history of cuff links during a recent visit in Champaign. He said that in the 1600s, men and women used ribbons or strings as cuff fasteners to keep the dirt and cold out of their sleeves. 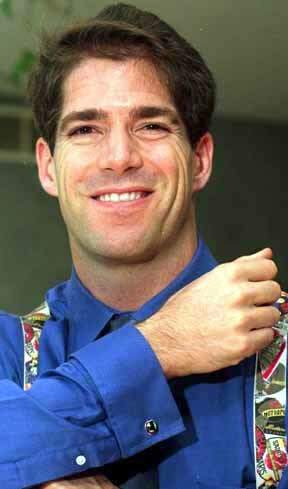 Later, they added jewels to the ties. Cuff link history, as collectors now know, stretches back to handmade items in the early 1700s and machine-made items in the early 1800s. Enameled cuff links  Anastasia's specialty  probably were first made in the early 1800s but did not become widely popular until the Bolshevik Revolution in Russia in 1917 when Faberge did jewelry work for the czar's family. ere made of metal, then coated with enamel made from colored silica, or sand and heated to 1,600 degrees. Anastasia can tell you about various styles of cuff links  cuff buttons, flats, chain links, snappers, or Kum-A-Parts. He plans to keep researching and has written the first draft of a book about them. He displayed dozens of samples from his collection in portable jewelry cases. They include a miniature art gallery of horse heads, royal figures and art deco designs. "I'm trying to paint a historical picture of the art styles throughout the las century," Anastasia said. "I especially like the art deco designs, but no, I really don't have any favorites. After awhile they all become like your kids." He once called himself a broker/dealer in antique cuff links, but admits he cannot bear to sell any of "his children." "I never sell, but I have traded," he said. Besides foreign cities, his shopping sites include United States antique stores, jewelry dealers, flea markets and even Bloomington's Third Sunday at the Market. He once got up at 5 a.m. to drive to an Orlando sale to buy a pair of cuff links that had unusual enameled designs on both sides. "I hound the dealers," Anastasia said. "That's why I have the most. Usually it's the dealers calling collectors." Despite his pride in knowing most sources, he admitted his girlfriend found a cuff link dealer he did not know about and bought him gold-filled, late Victorian period cuff links as a surprise gift last Christmas. "It just blew me away," he said. "She won't tell me her source, so I'm sure she's going back there this year." 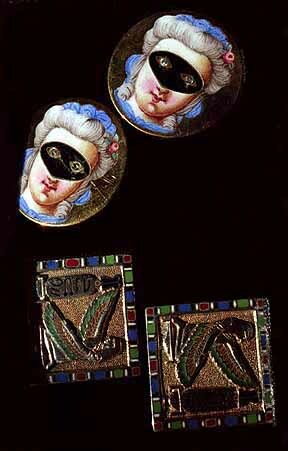 Anastasia started specializing in enameled cuff links in the early 1990s. Then, he could buy a pair with a sterling silver base for about $20. The current going rate is $150 to $200 a pair. 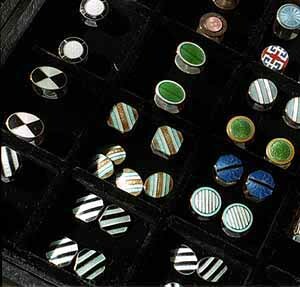 He has purchased cuff links for as little as $2 and as much as $1,200 but hates to set a price on the whole collection. He carries insurance on the whole lot but never plans to sell. He hopes his final collection will end up in a museum. He said the jewelry department of the Metropolitan Museum of Art was interested in an 1863 pair of cuff buttons with winged figures that he owns; the museum plans to display them soon. "Being able to donate to the Met makes a collector very happy," Anastasia said.